Come sea, sand, storm and salt, you’ll always get a grip in the chestnut brown leather CUTTER, a strong, sturdy, Boat Shoe with a rugged sole. 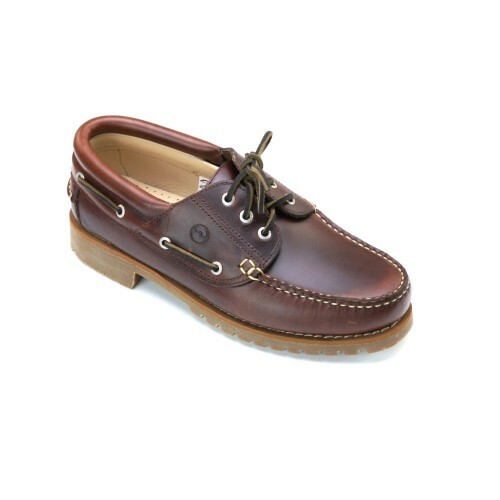 It’s a classic boat shoe with a twist. It’s an element-proof, hand-stitched moccasin with three eyelets and laced with strong rawhide but it has an extra-thick, extra-grip Commando Sole for when you’re storming the beach under fire at St. Nazaire or dancing up a storm at Club 55 at St. Tropez. I had expected at this price for the shoe to be as good as a Timberland but i was very disappointed. The leather is thinner and there is far too much room at the toe end so your feet swim around inside. Every bit as good as Timberland, at half the price and for the same quality, fit and comfort. Walked 5.6K in Them on day one.